Canadian event organizers get more bang for their buck by sharing their events on social media than people in most other countries, a new study shows. In fact, Canada is ranked third globally (behind Ireland and Australia)in terms of the dollar value per event shared on Facebook and takessecond spot (behind Ireland and ahead of the Netherlands) when it comesto the dollar value of events promoted on Twitter. The takeaway for Canadian businesses and organizations is that the mostlucrative ways to promote their events on social media are, in order ofdollar value, Facebook, LinkedIn and then Twitter. The takeaway for social media observers overall? That social mediasites aren’t just a passing fad and they are valuable business tools,Eventbrite’s global marketing vice-president Tamara Mendelsohn said inan interview from San Francisco. Eventbrite chart shows theglobal averages for extra site traffic and ticket revenue generatedeach time an event is shared on (L to R) Facebook, Twitter andLinkedIn. “The common perception is that the early (social media) adapters aremore engaged,more loyal, more active and drive more revenue. So you’d think asFacebook, Twitter and LinkedIn attract fewer high value usersover time – and as they become more mainstream – that they’dpotentially see the engagement or dollars per share go down. But that’snot what we saw at all,” Mendelsohn said. 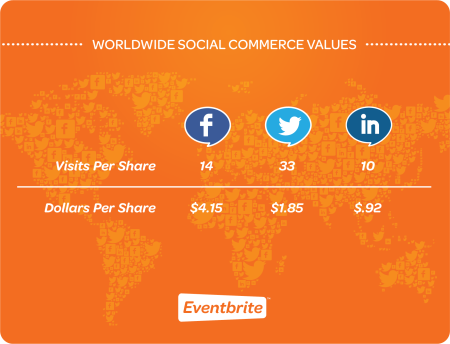 Breaking down the overall global results, the dollar value of socialevent sharing worldwide (as defined above) grew by 81per cent from $1.78 to $3.23 since the last Eventbrite study was donein 2010, while traffic generated on social media from events sharedrose 59 per cent since 2010. In a nutshell, sharing an event on Facebook drives the most additionalevent revenue; sharing an event onTwitter generates the most additional traffic back to that event’slisting on Eventbrite itself.